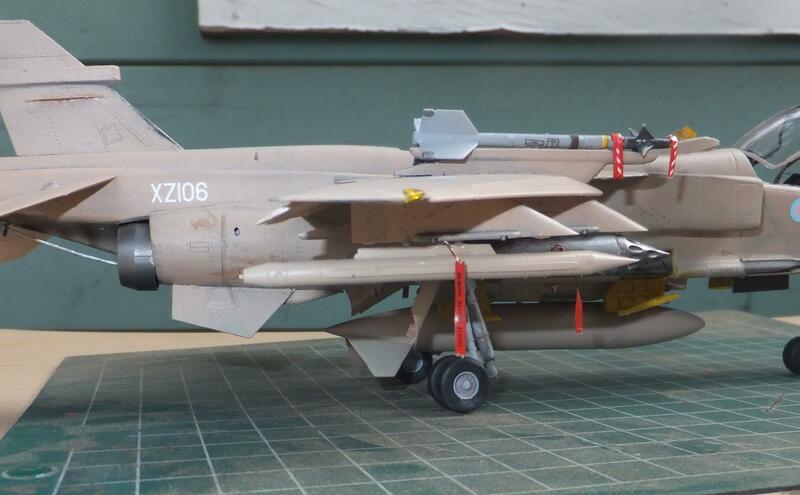 12 RAF Coltishall Jaguars were sent to Muharraq International Airport, Bahrain in October of 1990. Here would be their base of operation throughout if and when the war would start. 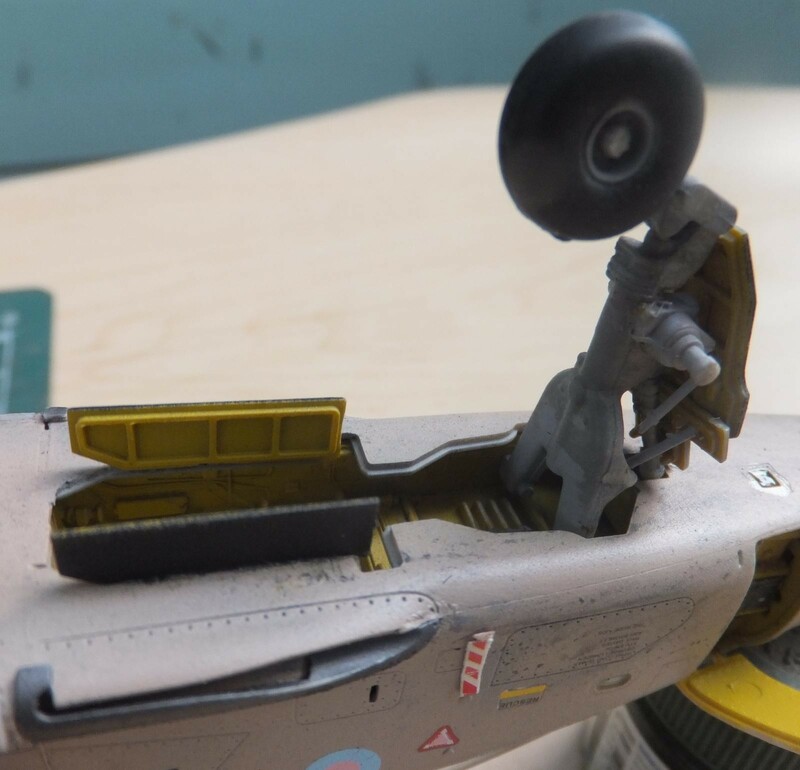 Several modifications were made to each of the Jags in theatre. 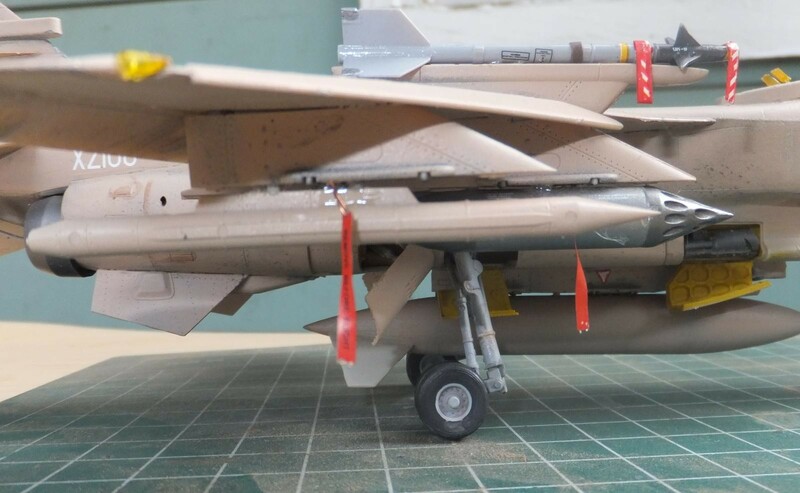 First the distinctive overwing rails fitted for self defense, which were the AIM-9L Sidewinder missiles, the reason to free up the underwing pylons for the necessary ground munitions and associated pods. 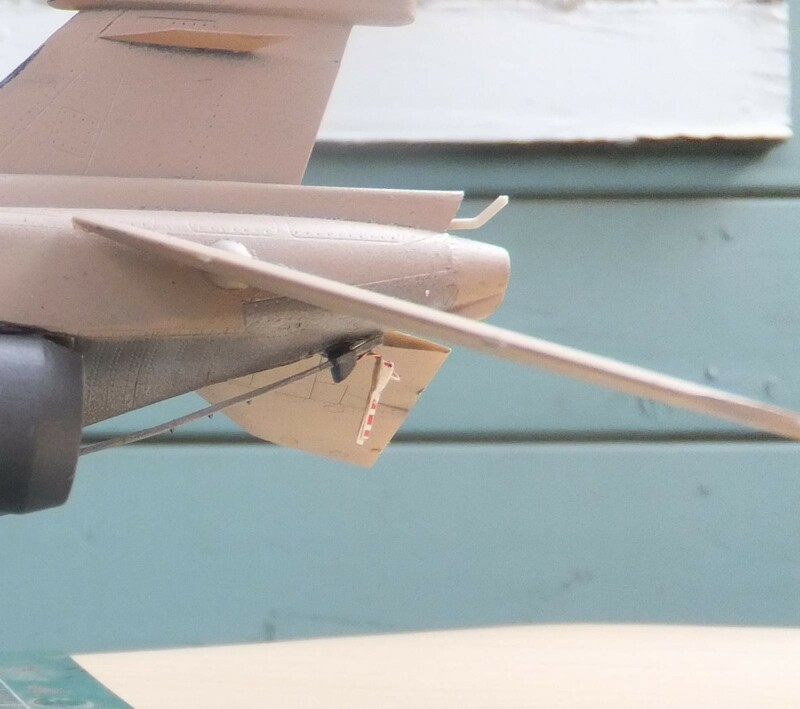 One of those was the Westinghouse AN/ALQ-101 (V)-10 ECM Jamming Pod mounted on the port outer pylon. A Philips-Matra Phimat Chaff dispenser mounted on the starboard outer pylon. 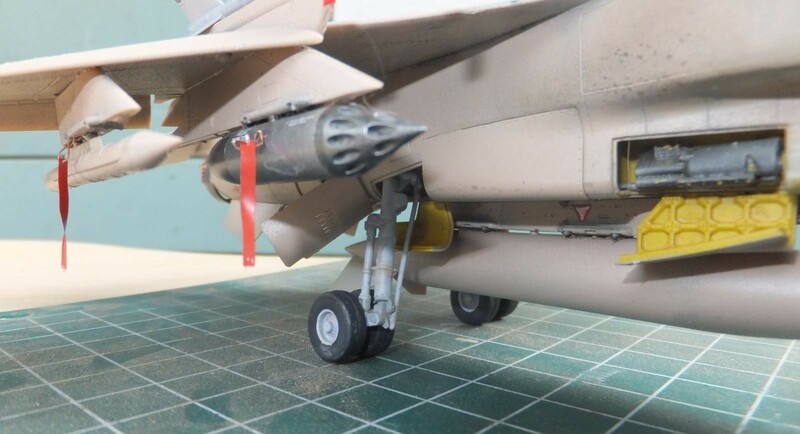 2 Tracor AN/ALE-40 flare dispensers under the tail. 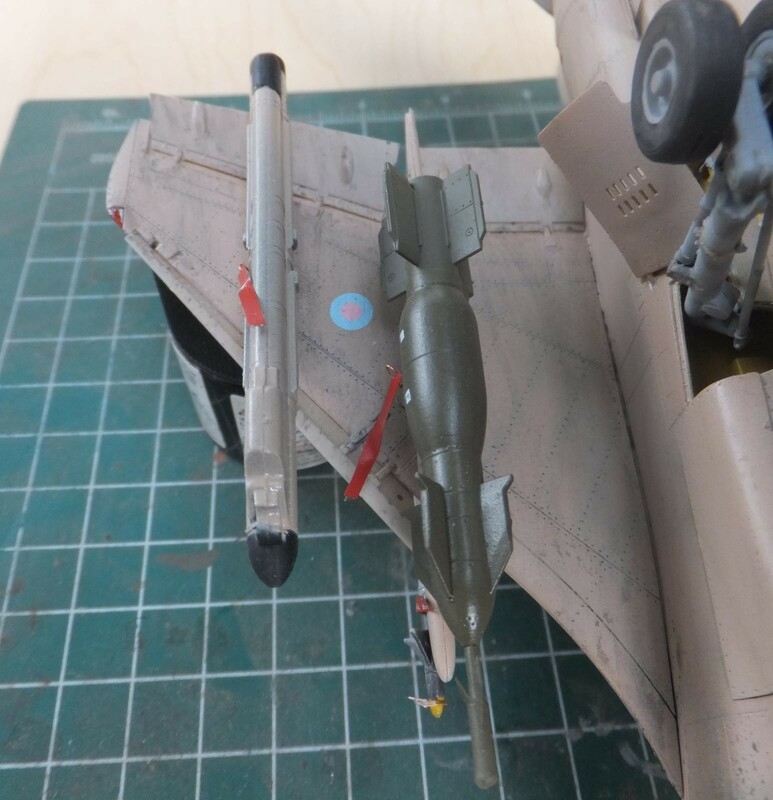 The original plan was to operate with 2 drop tanks and the center fuselage pylon to carry the ordnance. 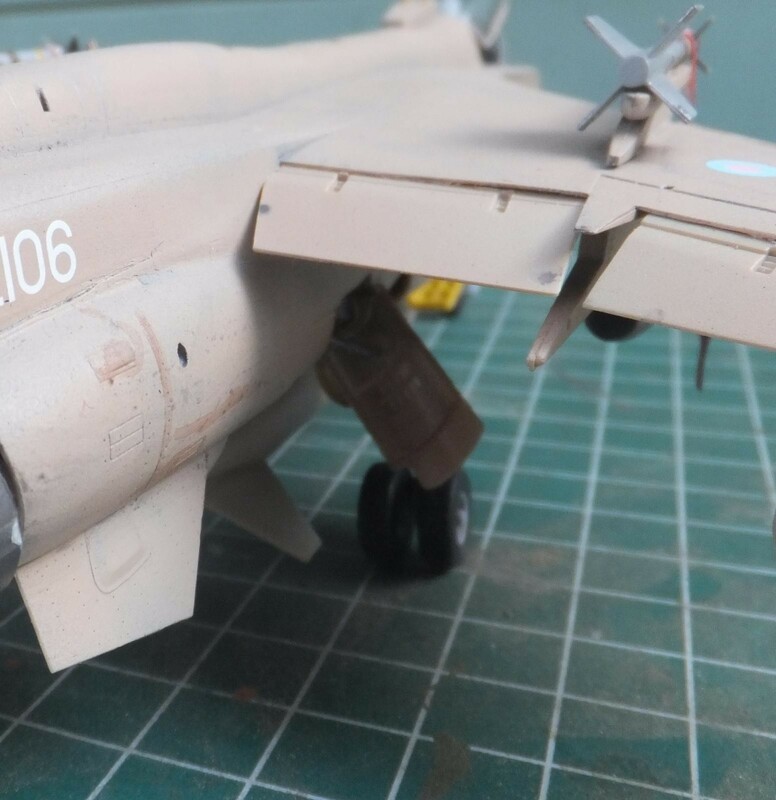 This really limited the weapons load to go along with Aden 30mm cannons. The JagDet was assigned daylight operations only and workups prior to combat were limited with bad weather. European tactics, at first had the training missions conducting low level missions over the desert. 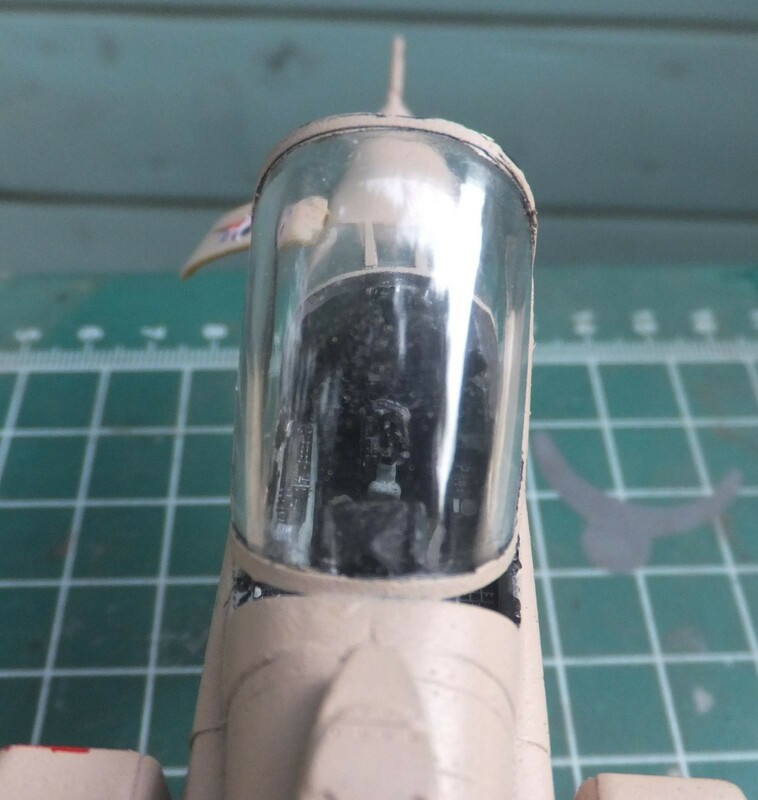 But a change was made to a medium level attack profile, supported by fighters and Wild Weasels jamming package before combat started, this gave the best prospect for safety. Which at the end of the war turned out to be true. 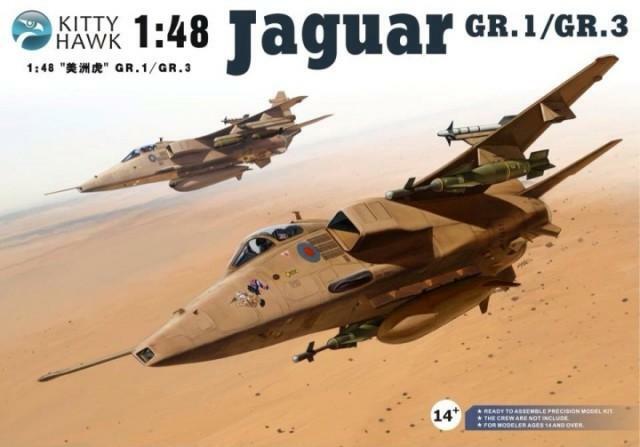 Not one Jaguar was lost in combat. Mission requirements set by coalition command to provide 2 eight ship missions per day. Though on day one only 4 Jaguars participated which involved attacking an Iraqi army barracks in Kuwait. 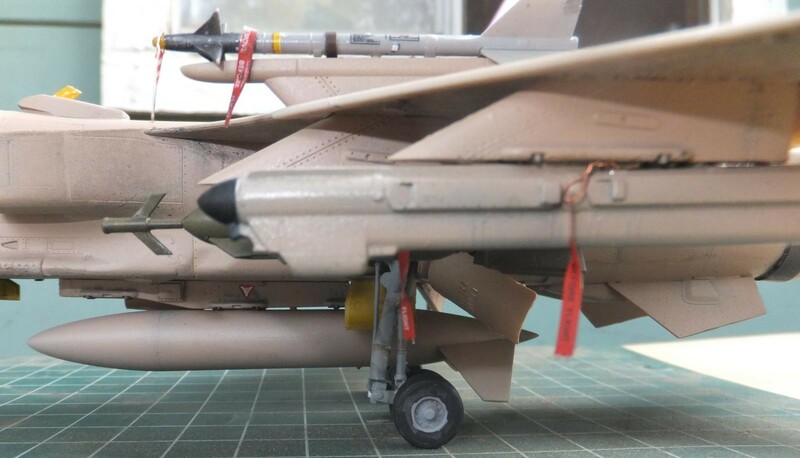 It didn’t take long to decide to change the configuration to drop tank on center pylon and the 2 inner pylons would be use for ordnance, which allowed the Jaguars to double their bomb load. At the start of the war, the main operating area of the JagDet was in Kuwait south of the capitol. Though special ops did send some packages to attack the Republican Guard encampments, and to a few targets into Iraq itself. The target list had fuel and ammunition dumps and command centers. On 26 January, Silkworm missile sites were added to the list and attacked that day. This in preparation for the much publicized amphibious landing to take place by the Marines, which was really a deception. Another type of mission the JagDet participated in was providing CAP and CSAR missions which 2 aircraft were detailed for this op, for up to 4 hours. On 5 February this mission requirement was no longer needed due to the lack of naval targets. Though 2 Jaguars did manage to sink an 1120 ton Polnocheny landing craft. As the air war was soon to become a ground war. Recon missions were soon added to the tasking. 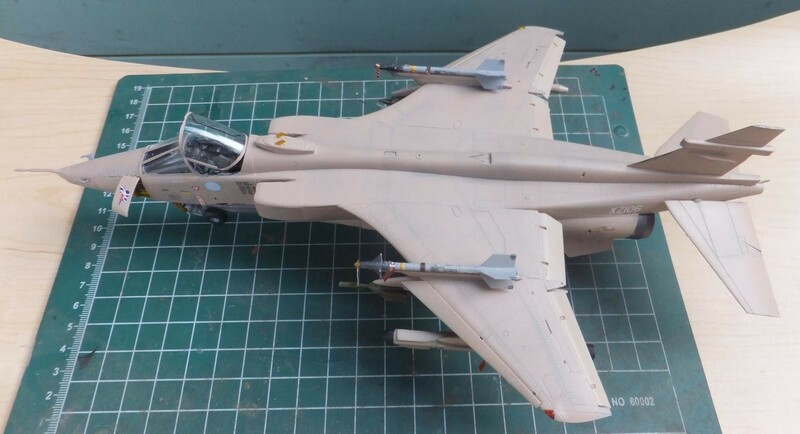 Though 4 BAe recon pods were sent to the Gulf. 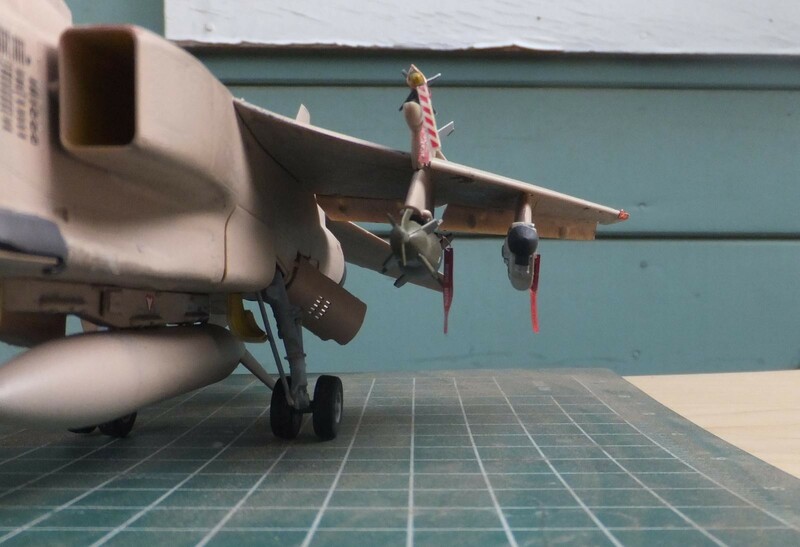 Only 2 aircraft were configured for the tasks. Flying in pairs or with an attack force for extra protection. The data gathered on the approach routes to future targets as a supplement to satellite imagery. 31 sorties were completed in this role. The final phase of the JagDet mission as the ground war approached, artillery pieces and equipment. Very successful these ops were, one in particular when destroying 5 Astros multi-range rocket launchers on 13 February. The land war began on 24 February, most of the JagDet sorties were north of Kuwait City which after 3 days the war ended. 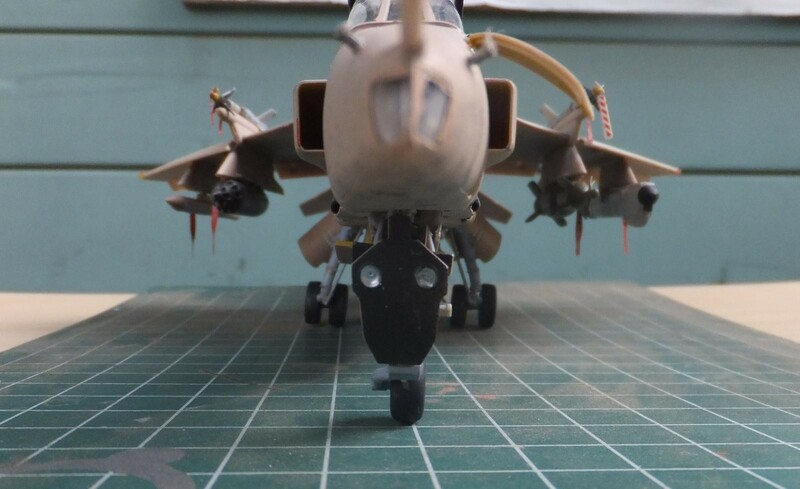 Final count was 611 sorties of all types flown by the Jaguar, of these 532, which represents 114 missions were offensive sorties, resulted in the release of 750 bombs of the 1000lbs variety, 385 CBU-87’s, 32 LAU-5003 pods(608 CRV-7 rockets) 8 BL755 CBU’s, 9000 rounds of 30mm ammunition and 3 AIM-9L Sidewinders(launched accidently). A tribute to a very effective platform. Delivering it’s warload and returning it’s aircrew safely home. The kit, after reading some of the reviews, I was ready to tackle this one. It was a love/hate/love/hate and finally done relationship with this kit. It started out like any relationship, loving kind, unselfish easy anything for you build at the beginning. So I’m thinking, what is everybody talking about, this kit is ok so far. 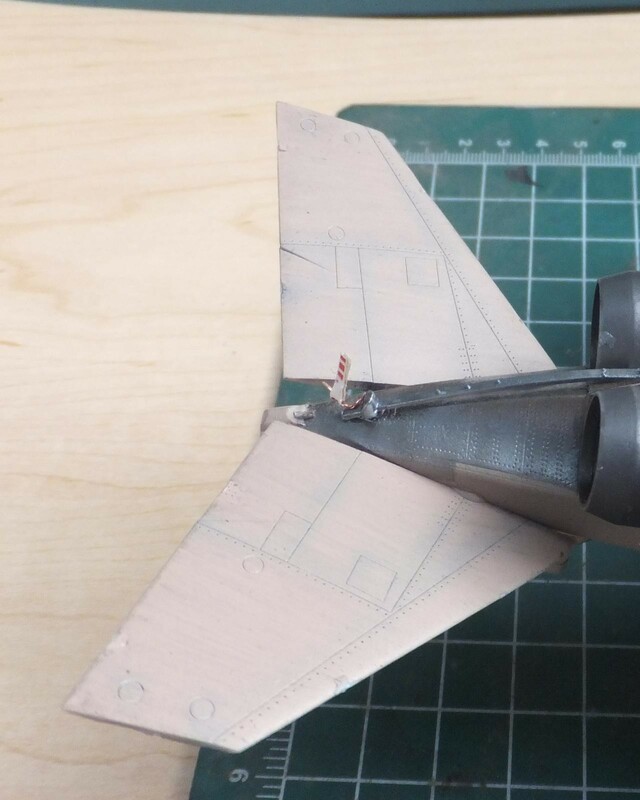 Once I was done with the forward fuselage, I skipped a couple of steps and started work on the main fuselage. and it was where you get to the engine part. This where test fitting will prevent misalignment issues. Well you need to pay attention to this section as you can muck it up here. And I did. 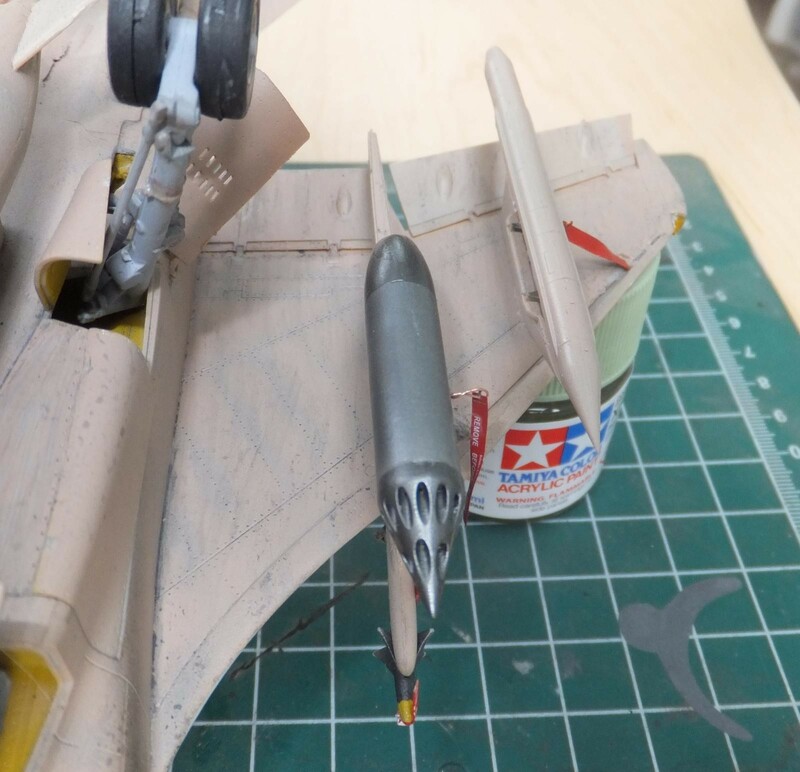 The one part I dreaded turned out wasn’t so bad was the landing gear and it’s complexity. 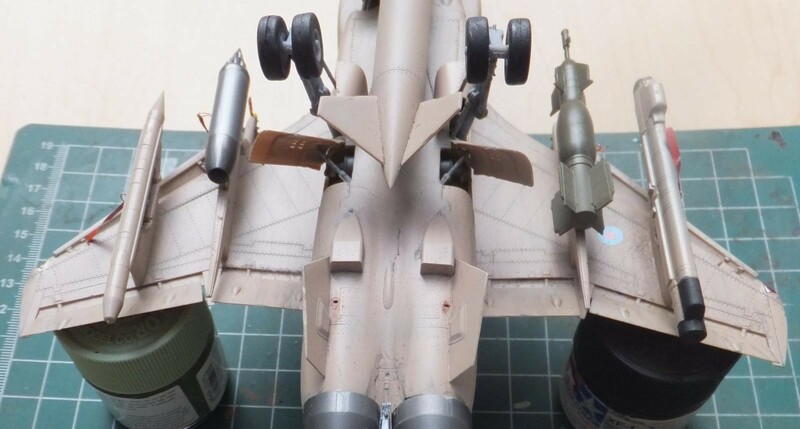 Yet unlike the Trumpeter MiG-23, it was not so difficult, still take your time. The gear is very sturdy, each mating point are positive and again by taking your time, it assembles ok. And is quite sturdy. 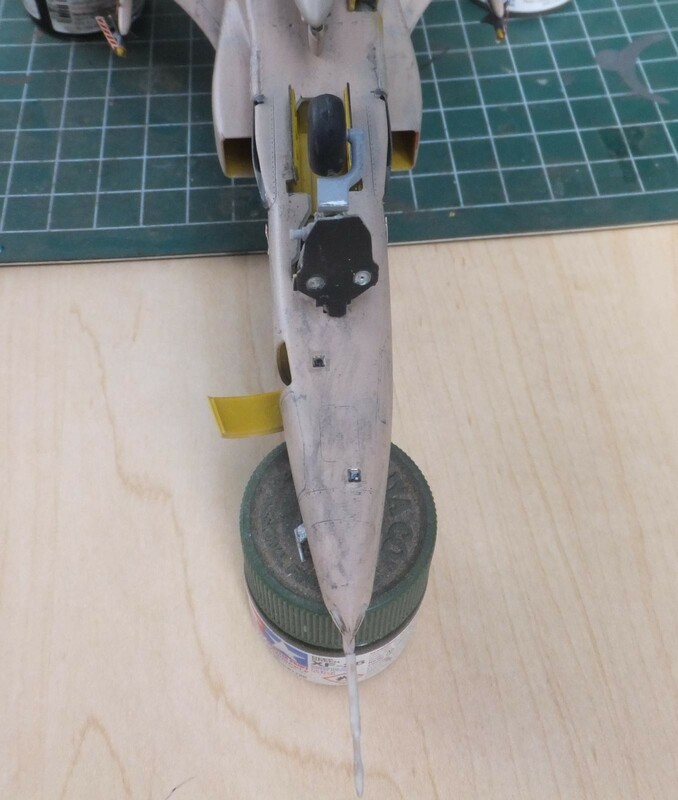 But still so many pieces and a little fiddly make up the landing gear endeavour. It took me 2 days just to be safe. There were some frustrating moments. 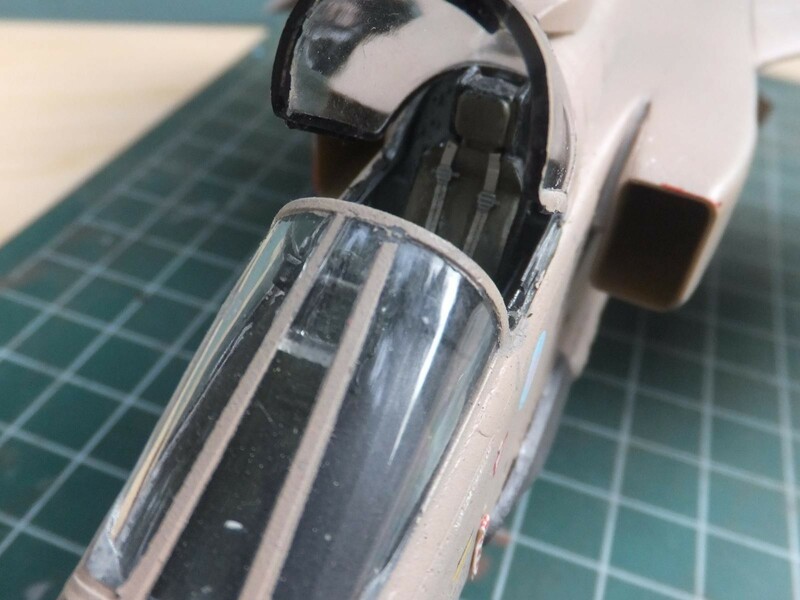 A little filler here and there especially around the lower fuselage section around the engines. I did find that the gear doors did fit well when in the closed position. 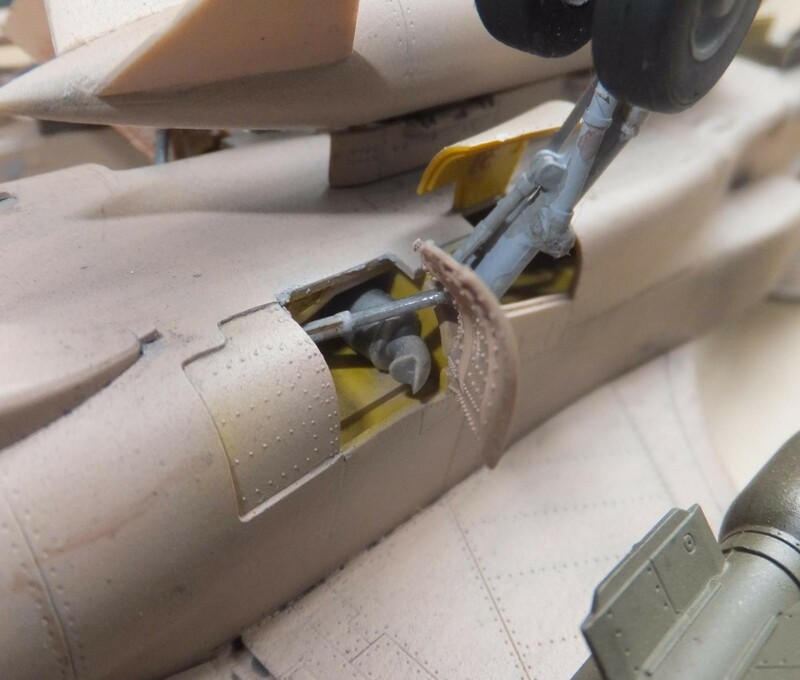 Also the open gear and compartment doors fit very well also when it came to attaching them. 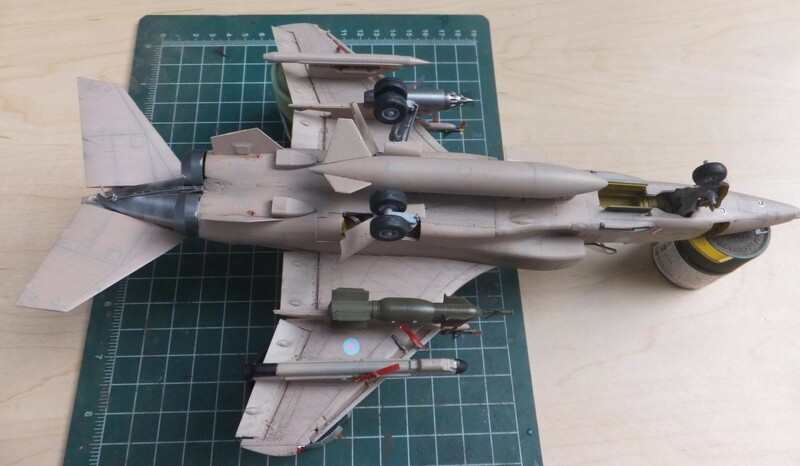 So yes it is a tough kit, labor intensive, and I still yet have to build a Hasegawa F-14. 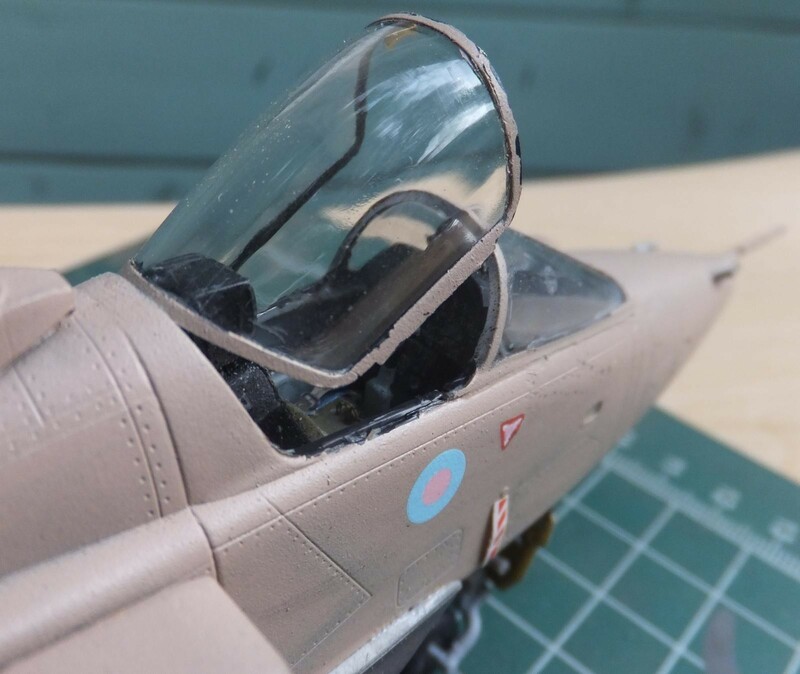 I used the Eduards zoom set to give it a little more enhancements to go along with the kits own PE fret that is in the kit. I used some of the stencils from the kit for the weapons and pylons. 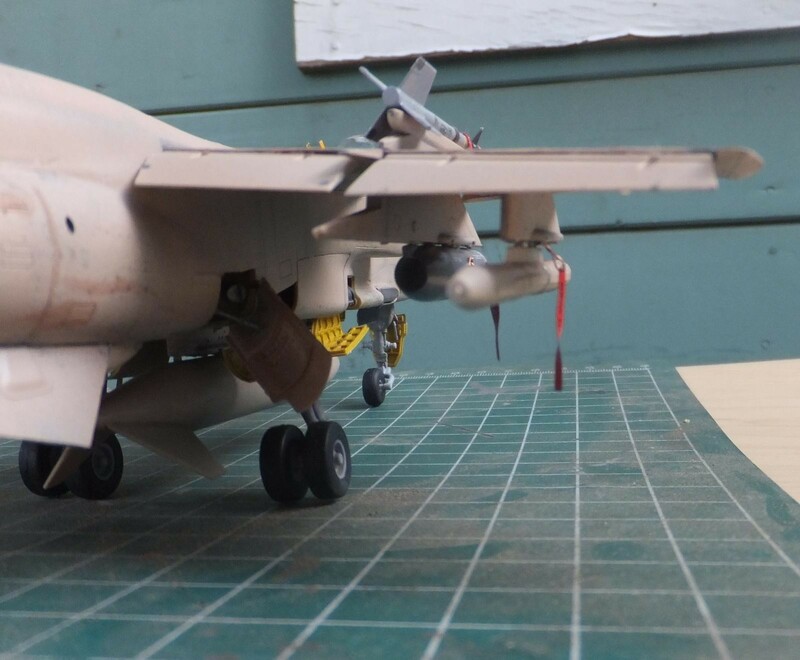 Eduards Remove Before Flight Tags, the AN/ALQ-101 pod came from the Monogram A-10, the Phimat Pod and weapons are from the kit. 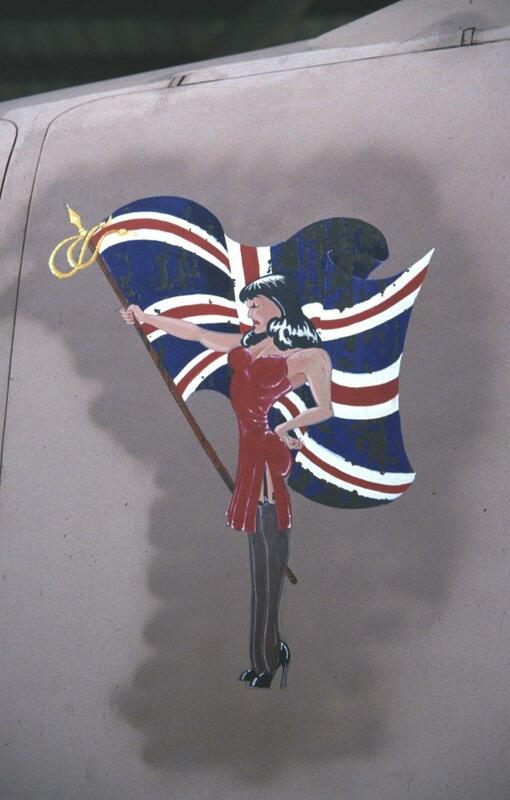 The decals for “Britania” are from Model Alliance 48-117. They worked out quite well using the Microscale process. 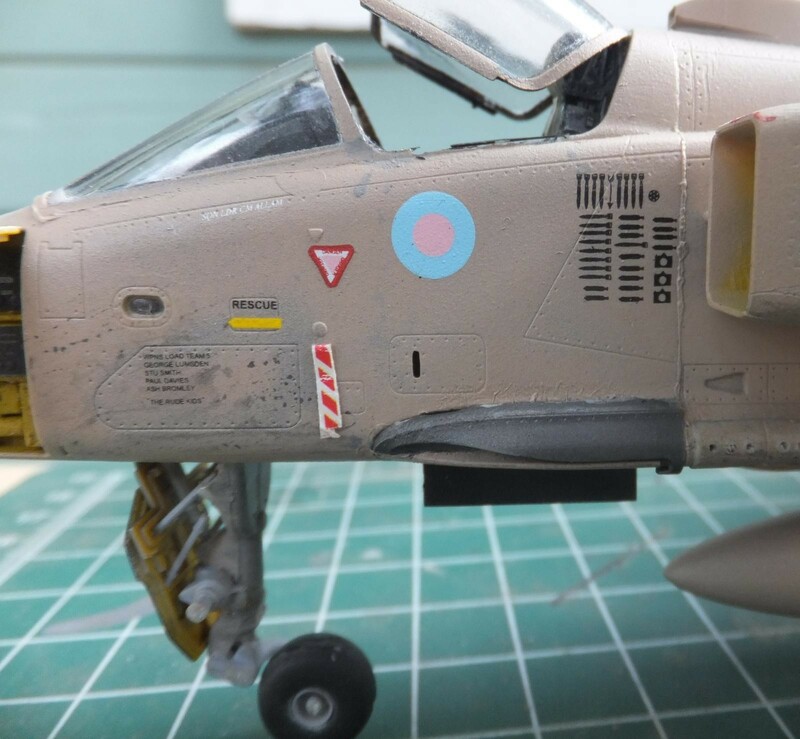 I used Xtracolour enamel for the RAF Desert Pink scheme. 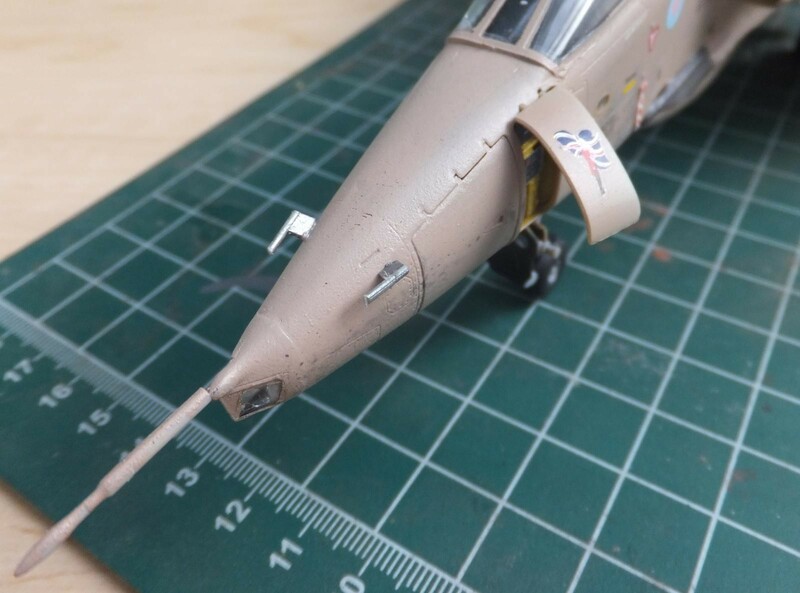 These Jags did get pretty weathered as they flew everyday when not down for a gripe. 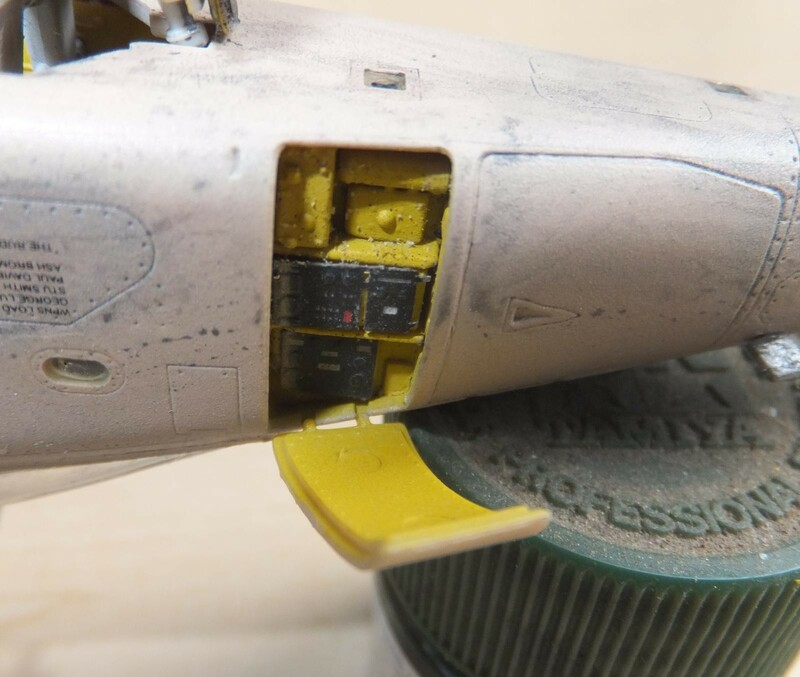 This finish on this particular one could use a little more weathering as the mission marks indicate. But overall I like how I survived it. 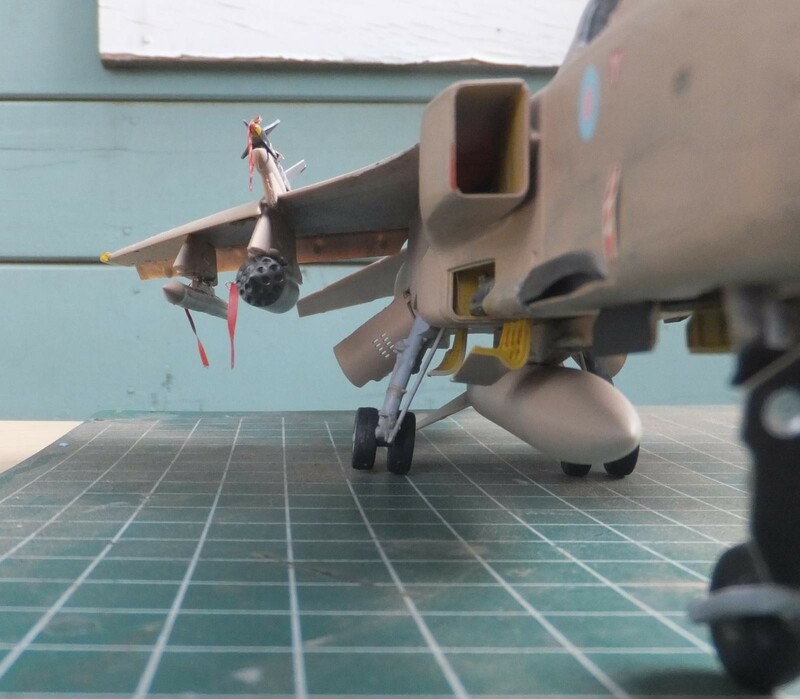 Will I build another one, good question, as I had planned to have several Jags on the ramp. 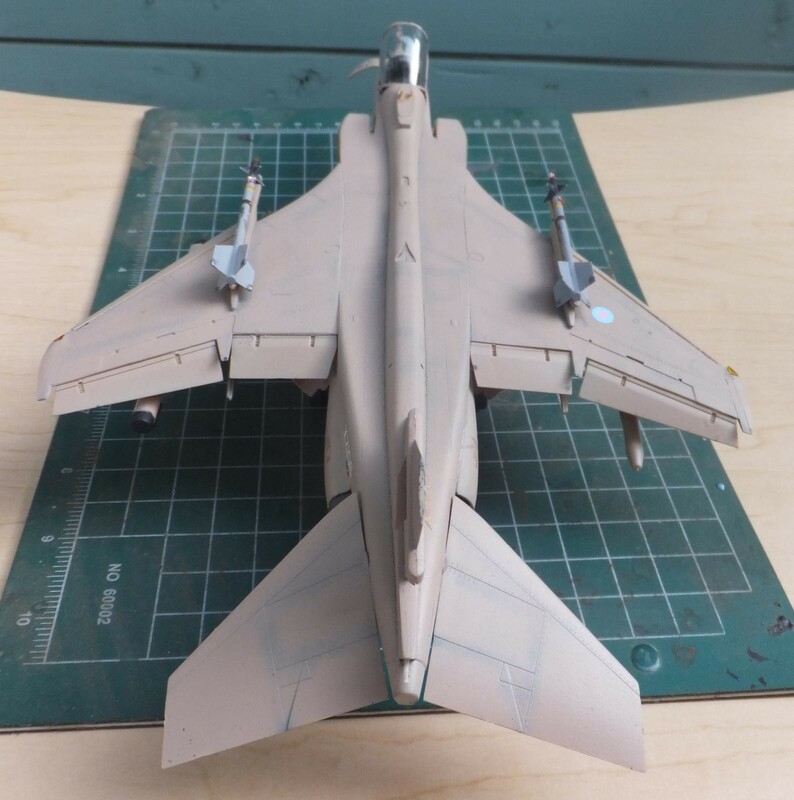 I may just get an Esci Jag which is much more simpler to build. It is a favorite of mine these Jags. This is the 1st Kitty Hawk I have attempted. I can understand why some just don’t like them if this is an indicator of what the other kits are like. It takes a lot of patience and test fits as you go along. 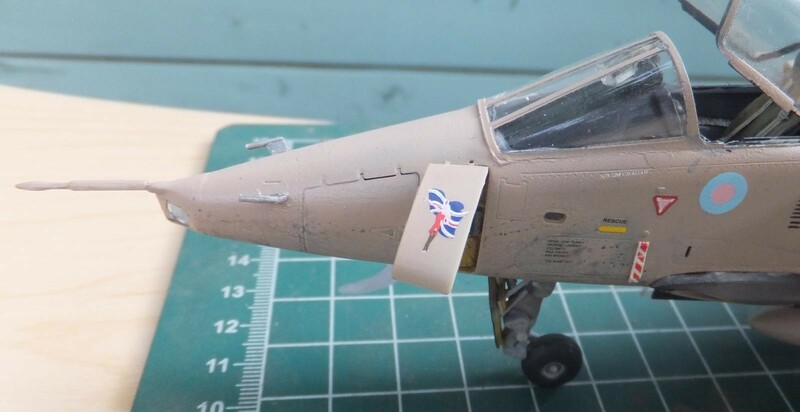 At this time I only have the KH Mirage F-1 was hoping to get the Kaman Seasprite and the Huey, don’t know about the SU-17/22 kit. 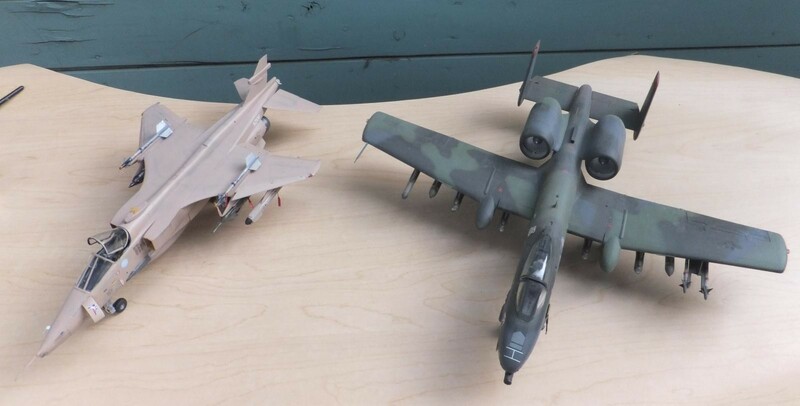 For comparison, with a couple of it’s coalition mates, Hase A-7E USN, and A Tamiya A-10. In the end, it is quite fulfilling that I finished it. A thanks to my good friend Louis for this wonderful GB. 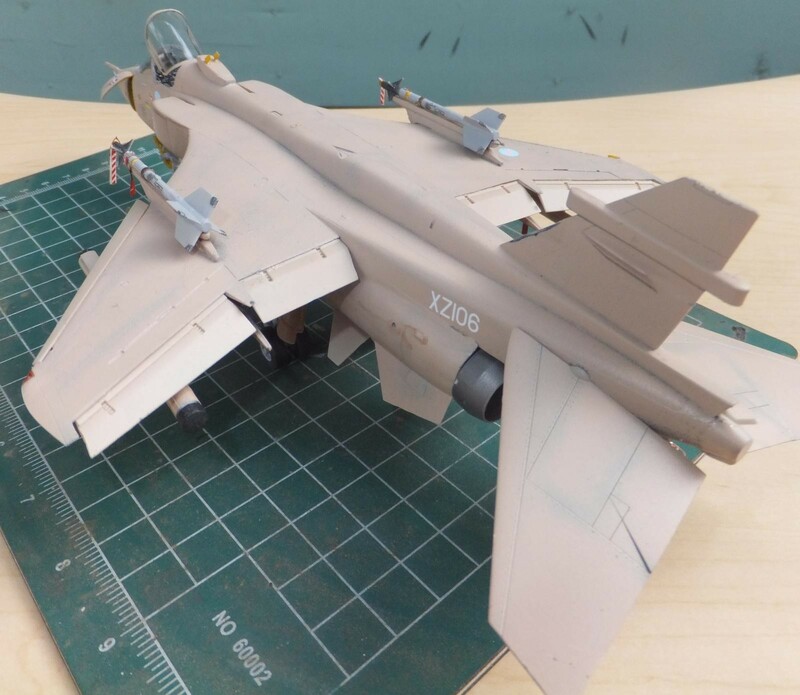 Encouragement from him and my fellow I modeler friends, and at this time I will dedicate this build for my friend looking down from heaven. Bernard Hackett Jr., who was always positive in his outlook and unselfish character. Rest in Peace my friend. Ready To Tackle This Kit? Get It From Amazon! Looks great, Chuck! 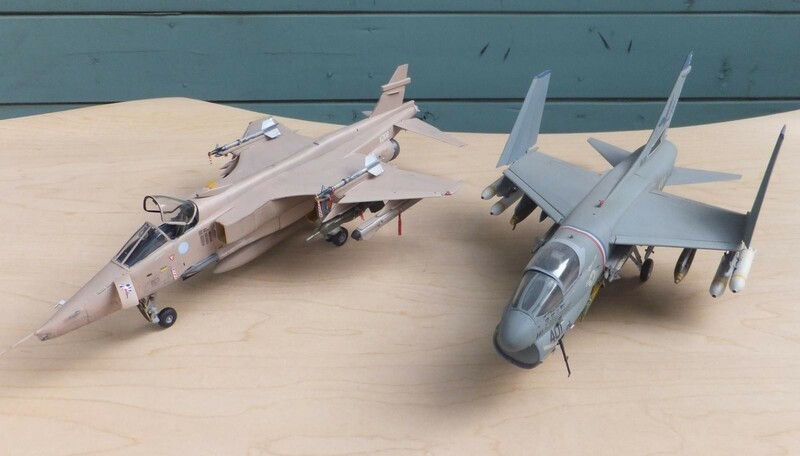 I never got to see any of these during Desert Storm, which I wanted to because I like these aircraft a lot. I like the weathering as you did it. Not too much, but showing plenty of use. Well done, Amigo. Bernie would have liked it. 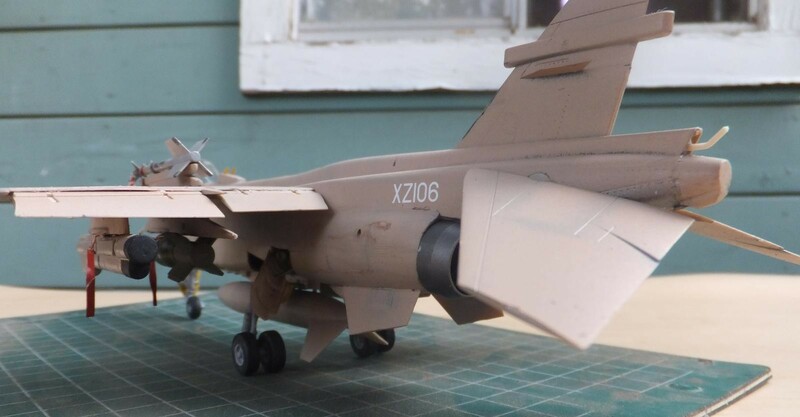 Nice build, Chuck….I like this one very much, my friend. Good lookin Jag Chuck. One of my favorite aircraft. Thanks Anthony, happy that it worked out to be a fulfilling build. This build turned out spectacular !!! I have been watching you build it from the very beginning. 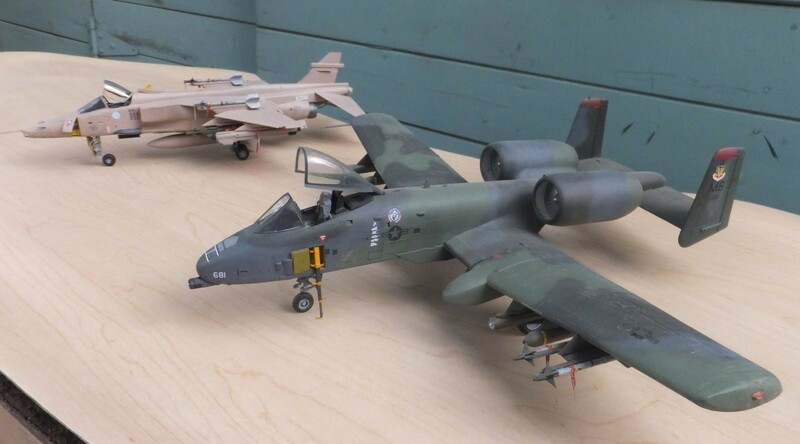 It looks right at home sitting next to the “Hog” and the Corsair II. Your story behind the operations that this type was involved in, was very detailed, and I learned some stuff reading it. I went down to see the Army recruiter on January 17th, 1991 after seeing the air war start on TV and listening to it on the radio. I wanted to get back in the Army in a bad way, but I had to get a “waiver” for dependents since I was married at the time to the “ex” and we had kids together. My last unit was on the ground there in Saudi Arabia when they deployed with the 82nd Airborne as part of Desert Shield. They provided armor protection and scouting resources as needed for the 82nd, until the ground war started. By the time I got the waiver, the ground war was over, and they were sending our guys back home, so I decided to stay home instead. I still have mixed emotions about that decision to this day. I often wonder “what if”. Thank you very much for contributing this excellent build to our Year of the Cat. You guys all made it a good one. I’ll be posting a recap article on the GB soon. I want to give some others a little more time to finish their projects so I can include photos of their work too. Thanks again buddy ………………. and Bernie would be proud. Thanks Louis appreciate that, sorry it took so long to post it. Sometimes you get into a writers block and how to approach the story. Could go several ways, the history of the aircraft itself, actual missions, or a compilation. 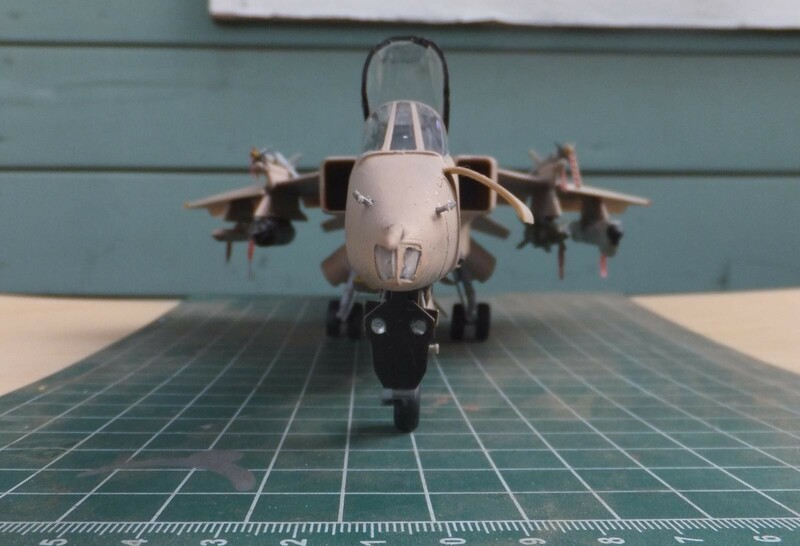 I did serve in Desert Storm, our squadron was based on the West Coast of Saudi Arabia, at the Tabuk Air Base, among the tenants was a RAF Tornado squadron, A-10’s from Louisiana, USMC maintaining security, our 2 rescue squadrons, HCS-5 and HCS-4 from Virginia. An Air Force Spec Ops unit with MH-53 Pave Lows, MH-60G Pave Hawks and C-130’s. Operations started on the 17th of January, a day after my birthday on the 16th. We were in the helo ready locked and loaded as the go was about to be given that morning. Our mission was to insert a SEAL and British SAS team somewhere in the Iraqi desert. Let them do their thing. Though they may have gone out together they did go their separate ways once inserted, different missions for those guys. Our first combat mission, it was an experience. Flying low with NVG’s, no FLIR or LORAN, I would fix that with the Sikorsky tech reps next couple of days. 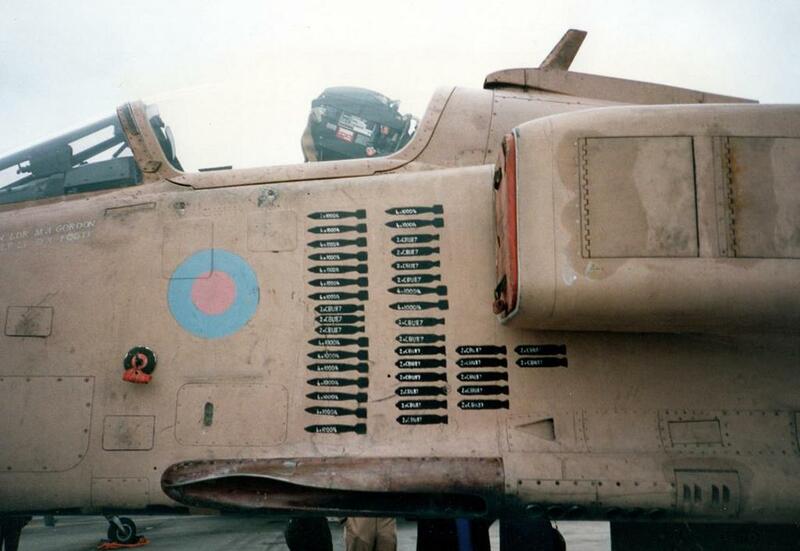 Also beef up the armament that we were currently using. I didn’t care much for the 5.62 mini guns. Fun at home, but the hostile environment I wanted to be able to go into a hot LZ with a little more firepower and requested we field mod our pintle mounts to carry the heavy Browning .50 cal machine gun on the door side, and mount the M60 7.62 machine gun on the port side. Keep them heads down. The Sikorsky tech at first told me it can’t be done. I said follow me, jumped in the Chevy 4wd(truck we brought with us from home, standard Navy issue vehicle in bright white) and drove over to the Air Force side of the base next to a Pave Hawk, I brought AO2 Torres with me so he could explain to the tech what he could do to mod one of our Firehawks to fire the Browning. I pointed to the tech see that, I want that on our birds. See the Pave Hawks have them, which means our air frame can withstand the recoil.. In fact our Navy version is rated differently than the Air Force and Army versions to withstand impact on Navy ship decks. Which points out the fact that the Navy version all variants, are rated stronger than the other guys birds. 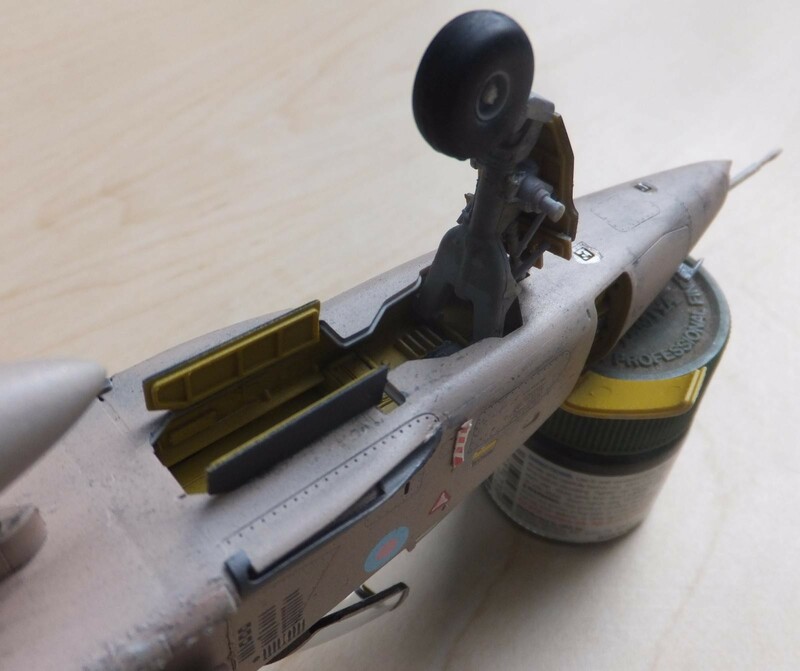 We had contacted one of the ordy’s from the Air Force helo’s to demonstrate how to modify the mounting points on the floor. So the tech rep says ok, so if I grant this where are you going to get the .50 cals from? Don’t think the Air Force are going to give you any. Ah I say, you forget my little tech rep, we use to be HAL-5, flying Huey gunships, we still have the 50’s leftover in the armory. I had 8 of them packed and brought them over with us. So call your people and I will tell my people to make the change. And authorize there use on our birds. Will modify both of our helo’s, HCS-4 are on their own if they wish to do so. Oh by the way we need FLIR and LORAN, like Stat! I don’t want to slam into a sand dune in the middle of the night. Our profile is to fly low and I mean real low. It was good to be the king. Department head really. 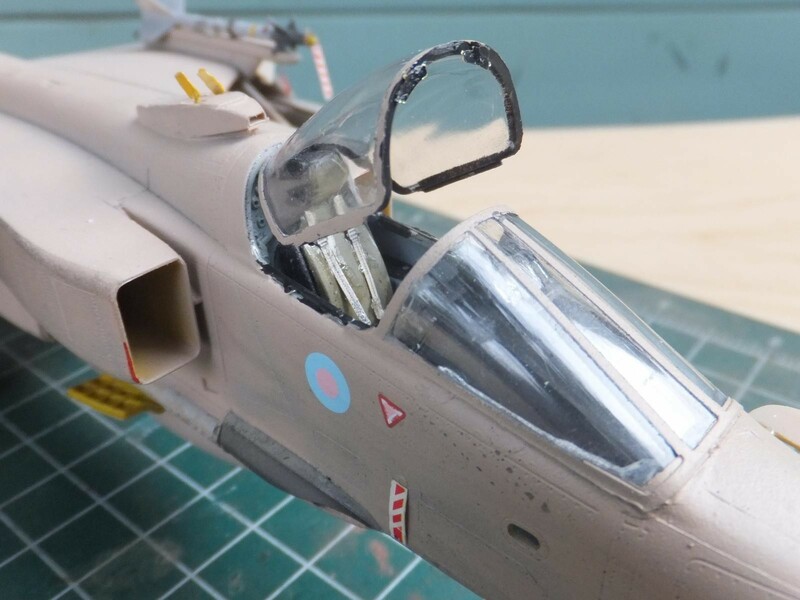 Thanks Greg, I still like the way you did yours in flight and catch some details I missed on my 72nd scale Jags built awhile back. 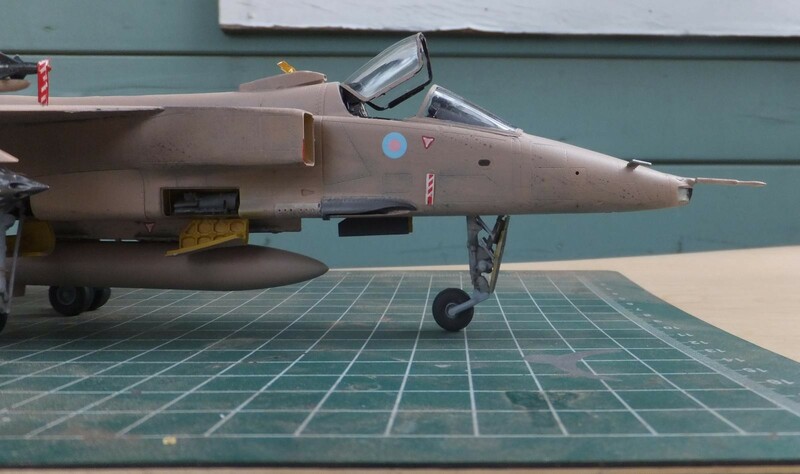 Great Jaguar build! Your Desert storm recollection is awesome, Well done sir.